Land-based pioneer Atlantic Sapphire is now in full swing in the tropics. Tiny fry jump around in the white tubs. Outside, the heat is 86 degrees Fahrenheit (30 degrees Celsius). Inside the fry feeding department, it is 14 degrees. Perfect for salmon. “If you look at the growth table, then 14 degrees is optimal. That is why we have a quick turnover of the fish,” said Atlantic Sapphire CEO Johan Andreassen to SalmonBusiness. 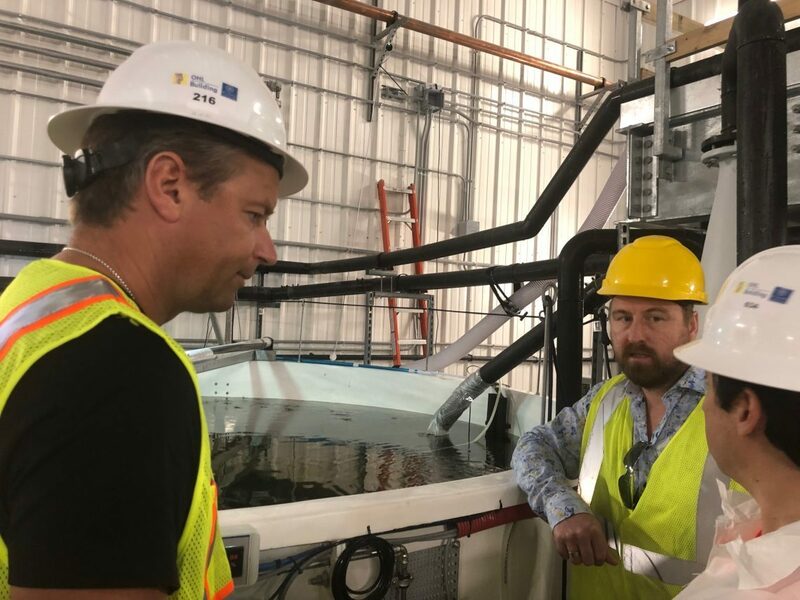 The farmer, with lessons learnt from his first company, Villa Organic, the first Norwegian organic salmon farming company, has finally got fish to work with. The facility is an hour’s drive from Miami. Construction workers, carpenters, electricians and plumbers are working hectically. Atlantic Sapphires’ Bluehouse in Florida is still a construction site but the farming operation has started. Now the plant houses three generations comprised half a million eggs, half a million on starting feed and half a million fry. “The eggs come from Stofnfiskur in Iceland. We also have a batch from AquaGen,” said Onsite Operations Manager Ryan Rubino. In the initial feeding, everything has gone as far as planned. “We had 600,000 fish here. Everything went well and as expected,” continues Rubino. These fish have now moved on to “parr”. 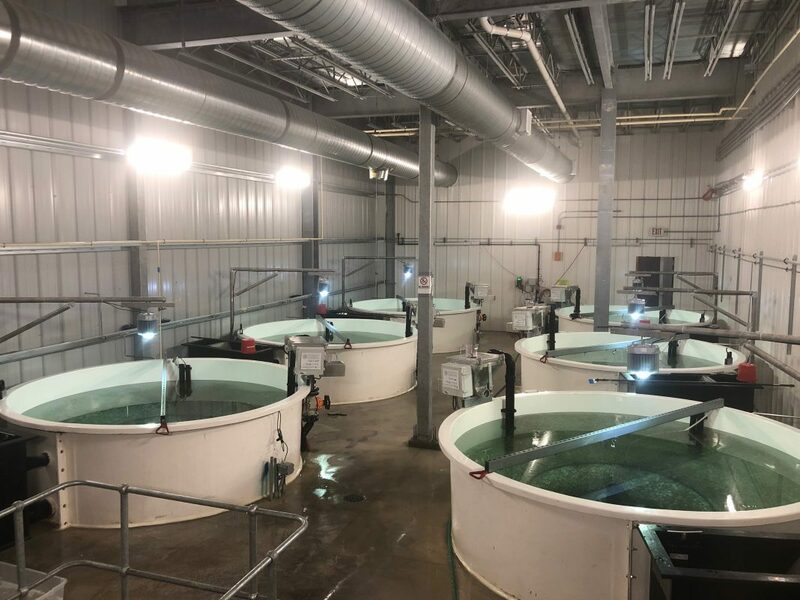 The next department is “pre-smolt” and “post-smolt” – with increasingly larger tanks and space for the fish. The water in the tubs is dark and not as clean as it will be soon. “We are now running a benchmark between Stofnfiskur and AquaGen. It is difficult to see any differences so far. Mortality is extremely low, and lower than we have in our budget,” he continued. 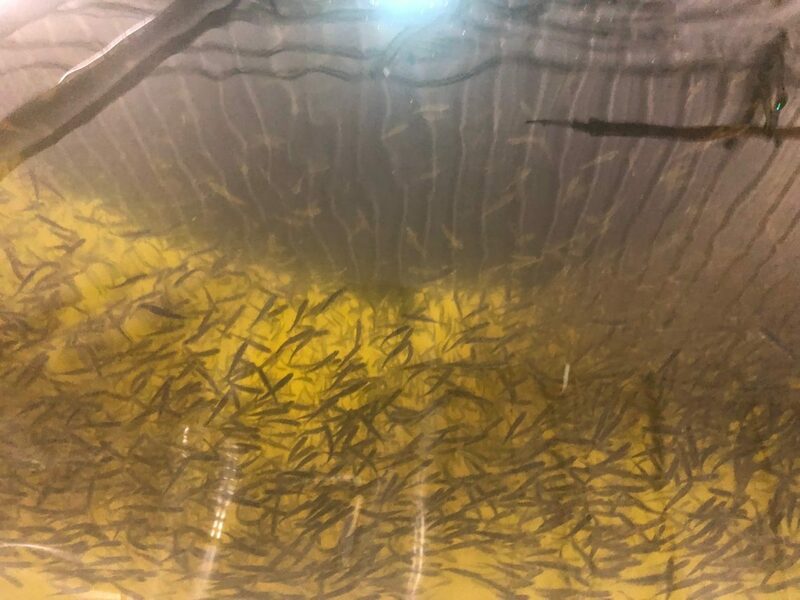 So far, Atlantic Sapphire’s plant in Florida is really a hatchery and smolt plant. “Here we feel that we have good control. The risk increases fish by fish,” admitted Andreassen. 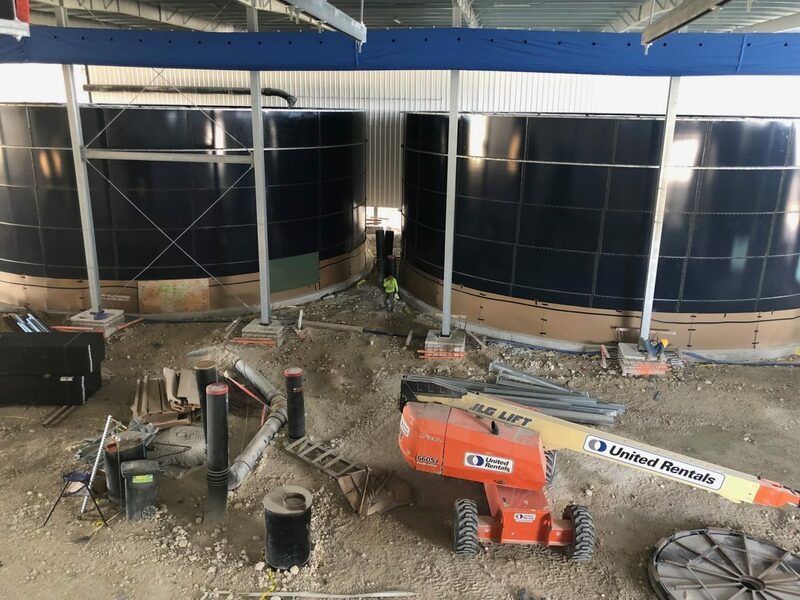 The towering steel tanks, which will house the food fish, are under construction and soon ready for effort. Atlantic Sapphire has been struggling for a long time with the operation of its Danish subsidiary, Langsand Laks. They have hopefully learned from their mistakes, including with fouling growth. 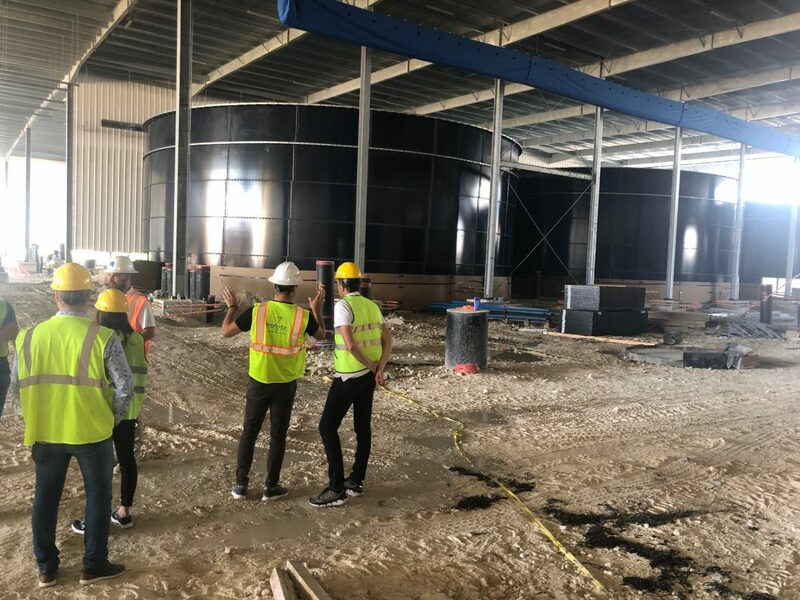 The steel tanks in Florida are covered on the inside with a white porcelain coating. “There is a maintenance-free surface. It does not have a collection of material. It’s just like a glass bottle, this one. It’s coated in porcelain and completely germ-free,” he said. The water is collected from the ground, deep below the plant. Here, there aren’t any larvae, barnacles or mussels. “We do not have any fouling growth. There is nothing coming in here. The worst thing is that we are on a land outside Miami. Here is no water anywhere. Everything is pumped in and pumped out,” said Andreassen. “We have 36 such tanks in our plant. In Denmark, we have six. They are 17.5 meters in diameter and 7.5 meters high. In Denmark, the tanks are in concrete,” he added. Andreassen believes the investment capital is well used down here. Not least, when one compares with licensing prices of up to EUR 20 million at home in Norway. “We spend USD 45,000 per acre. Then we put ten million dollars in capex on top,” he added.